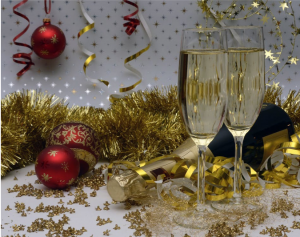 Part of prepping for the holidays in the business world is sending out an end-of-year holiday message to clients, customers and vendors expressing your appreciation and gratitude for getting to work with them throughout the year but don’t overlook your employees in the hustle and bustle. Holiday messages are both the perfect opportunity for generating employee engagement and a way to show employee appreciation depending on the approach you choose. Every year there are more digital options for creating and distributing holiday messages. Video is always a popular option because of how engaging and flexible it can be. Get your employees involved in making a video as part of your holiday messages. It’ll give them a break from the day-to-day tasks that fry their minds so late in the season and they can have fun with it, whether you decide to go fun and goofy or sentimental. 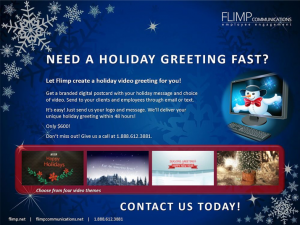 Video can be cheaper to produce than printed holiday cards and offer the opportunity to help your clients, customers and vendors to humanize your company and employees. With a message going out to the clients or vendors employees are working with every day, they’ll appreciate being given the opportunity to put a personal touch on it. Not everyone is going to want to be seen on camera but there are so many aspects to the video production process where their contributions are necessary and welcome from drafting a script to decorating a backdrop. And what better message can you send out at this time of year to represent your company than one put together collaboratively? How much involvement you’ll need from employees at the individual level will depend on the type of video you decide to make. • Photo Slideshow — A simple type of videos to create, it’s also one that allows for a wide spectrum of tones for your messaging. You can highlight major changes or events your company has seen in the past year from relocating and adding staff to retirements and product launches. • Testimonial — Deliver your holiday message to everyone first hand, whether it’s your CEO speaking for the company as a whole or the entire workforce gathered to shout “happy holidays” in unison, a testimonial style video puts a face on your company and is easily more personal than signing a card. • Performance/Sketch — Probably the most complex option, putting together a sketch for employees to enact can also be a lot of fun when people get into it. This is one option that works best when planned well in advance. • Animated — There are a lot of animated options available, especially for those looking for last-minute video options. At Flimp, we have several templates to choose from that can be quickly adjusted to include your desired message as well as corporate logo. Make sure your employees know that your appreciation extends to the work they do too, whether they’re on the front lines in customer service or hard at work behind the scenes keeping everything running smoothly. Video messages featuring executives and managers can be distributed to show that you know your company’s successes are only possible because of everyone’s contributions. Contact us to learn more about our holiday messaging options.